That happens if there is work south of Brooklyn Bridge. Otherwise, it makes no sense to do so. 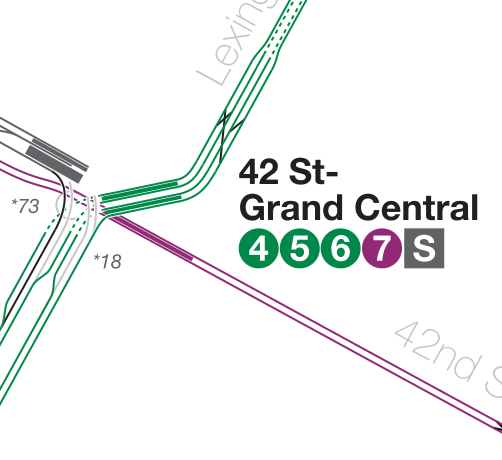 Terminating the at Grand Central pretty much forces the to run local in Manhattan. South of Grand Central, the northbound express track would definitely be out of service because of the reversing trains. The southbound express track could be held up while waiting for the to clear out of the northbound express track. North of Grand Central, it would be possible to continue running express service, but service would be delayed by the terminating trains. Really the answer here is to fix flagging and GO productivity. We’ve become so acclimated to 10-20 GOs/weekend and 12 min headways that that unreliability has become almost normalized — it shouldn’t be that way. Along with all the other operations reforms, there needs to be a long hard look at flagging rules (and temporary track barrier systems) along with the way the actual work is staffed/done. That second part especially is a heavy lift politically, but it really needs to be done. No other world class system is as bad at maintenance as NYC. The scary part of is this is from 2009 right before the draconian service cuts. I doubt much has changed in the last 10 years. LOL.... You're a smart guy. You probably have no idea, but all of these companies are MILKING the for whatever they can on EACH and EVERY project. I used to see some of the change orders for some of the projects that we got (not with the but with other commercial projects) since I worked in a department that was within the accounting department. With all of the changes to the original scope of work, it all adds up (yes it's all agreed to in writing with a contract, but a good contractor knows where to make money here and there), (the same thing happens in my field too - I run a department so I know - it happens all over) and if there's no supervision, then YES, guys definitely take advantage. It's basically the icing on the cake. With the union involved the also has to have a certain amount of guys on the job supposedly for safety purposes. It's abuse at its finest, and it makes the workers that actually give a damn and work hard get a bad rep, but yes there are those who are taking advantage, and quite frankly the 's hands are tied in some respects, so yet again it is the riders that are suffering. These projects seem to be never ending. The is rarely running in Brooklyn on weekends. I was shocked to see it this weekend in fact, but of course it was local in Manhattan. The reality is these guys know that the can't oversee all of this work so when the cat is away the mice will play. There's always some down time to be had... Hell even when I had to meet with some of my colleagues when we had to go onsite to meet clients about this or that, there were down periods then too. LOL.... You're a smart guy. You probably have no idea, but all of these companies are MILKING the for whatever they can on EACH and EVERY project. With all of the changes to the original scope of work, it all adds up, and if there's no supervision, then YES, guys definitely take advantage. It's basically the icing on the cake. With the union involved the also has to have a certain amount of guys on the job supposedly for safety purposes. It's basically abuse at its finest, and it makes the workers that actually give a damn and work hard a bad rep, but yes there are those who are taking advantage, and quite frankly the 's hands are tied in some respects, so yet again it is the riders that are suffering. These projects seem to be never ending. The is rarely running in Brooklyn on weekends. I was shocked to see it this weekend in fact, but of course it was local in Manhattan. So true. But due to the complexities of the 's organizational structure it's impossible to pinpoint who to blame. So true. But due to the complexities of the MTA's organizational structure it's impossible to pinpoint who to blame. As for who to blame... Everyone shares the mess... The needs to cut costs yet it doesn't where it should, so it looks to do so by cutting service either officially or unofficially to balance their budget as they are required to by law. Their construction costs are sky high and some of the highest in the world of any transportation agency around, and that isn't changing anytime soon because the unions here are powerful. Overhead expenses will continue to be a big problem for the long term and there is no way around that. The more customization you need, the more costs go up and a lot of what the needs has to be customized. Add into it the crumbling infrastructure, ongoing borrowing and cost overruns for this and that among the other things that they are horrible with when it comes to cost control and it's a recipe for disaster. As for who to blame... Everyone shares the mess... The needs to cut costs yet it doesn't where it should, so it looks to do so by cutting service either officially or unofficially to balance their budget as they are required to by law. Their construction costs are sky high and some the highest in the world of any transportation agency around, and that isn't changing anytime soon because the unions here are powerful. Overhead expenses will continue to be a big problem for the long term and there is no way around that. The more customization you need, the more costs go up and a lot of what the needs has to be customized. Add into it the crumbling infrastructure, ongoing borrowing and cost overruns for this and that among the other things that they are horrible with when it comes to cost control and it's a recipe for disaster. And I'm very surprised as to why the hasn't filed for bankruptcy given the eternal financial problems they've faced then and now. No, they just pass the costs onto us. People like to talk about how CHEAP transportation is in this City, yet they leave out the fact that we subsidize the system over and over again through numerous surcharges. Your utility bill has an surcharge in it. surcharge for the tolls and cab rides taken and on and on, so yes given all of that, the fares should be low, but we taxpayers shoulder a lot of the cost, and then of course the fare hikes every few years. It's unsustainable. Wow. You really could say this was from 2019 and I would still believe you. Actually in some respects it has worsened. Think about it. Healthcare costs have skyrocketed, certainly rising far faster than inflation. The has to deal with increasing overhead with each new contract. They try to fight that by cutting back on workers needed here and there and look for concessions where they can find them. The scary part is that we were in a recession from 2009 on. We are NOT in a recession now. The economy is BOOMING, yet the is broke (or so they claim, in part because of mismanagement, ongoing spending, etc. ), and I'm sorry but there's no way in hell you can tell me that an agency is sound when they don't even know how much they lose from fare beating every year. No it doesn't account for all of their revenue (not even close), but it's an example of how sloppy they are and how they lose so much money. All I know is if I ran my department the way that the runs their finances, I'd be out of a job and on the unemployment line. lol Just amazing... Congestion pricing will help, but it certainly won't be a panacea, that's for sure. Management is key. Even with congestion pricing we won't be guaranteed anything by the ... it's a blank check. The issue w/ productivity transcends unions. It's politics (which ties the MTA's hands rel. to unions) and management (doing the same GO twice for projects that could have been done concurrently) and infrastructure (fewer than necessary work trains, only 2 work yards). Correct. MTA costs are rising *way* faster than inflation. You fix that either before you ask for more, or as a binding condition to be allowed to spend more. Otherwise you're just kicking the can 5, 10 years down the road. Where would you put additional work yards? And I'm still ticked about how when the was going to Flatbush on weekends, the was forced to go local. The went local because of the incompetence of having to run only 15 TPH thru the Lexington Av Line on weekends due to one track being out of service for repairs, merging the onto one track. Since the had to run every 12 minutes = 5TPH, that left only ~10TPH to distribute between the . Since the has to run every 8 minutes due to high ridership in the Bronx, the (the local) bits the bullet and gets stuck with 12 minute headways. Since the UES cannot deal with only one local train every 12 minutes, the has to run local with the . and no, the could not have been made the weekend local with the even though it made more sense to distribute Express/Local service (10 locals/8 expresses), White Plains would have gone berserk had the Weekend been sent local all the way thru (since internally its really just the via Lexington, with train crews). The was going to be local after 1am anyway, so might as well have that service go local. The was express all night, made no sense to have it run local. MTA did have the go local with the a few times while the was normal. One time the even ran overnight on the weekend as a local, meaning the , , all were making local stops overnight. Since the has to run every 8 minutes due to high ridership in the Bronx, the (the local) bits the bullet and gets stuck with 12 minute headways. 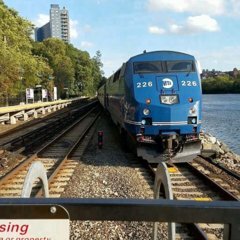 Since the UES cannot deal with only one local train every 12 minutes, the has to run local with the . And let's not forget that is for DELAY...I can recall adding about 10 minutes to my commute to work after a train had to be stalled near 135th Street due to signal work during rush hour, which is unfathomable given the sheer amount of commuters riding the subway at this time. And whenever there's no work on the tracks, trains are delayed because of so much door holding while passengers fail to realize that all those seconds holding doors add up very quickly to put the entire train (and all others behind it) behind schedule.